Last night was another rough night. 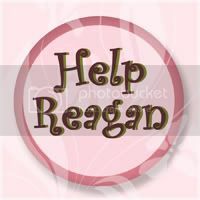 Even though we had a night nurse, I still got up several times because I heard Reagan crying! When she was awake...she was crying. She was pretty much the same all morning as well. Very tense, very uncomfortable...poor thing! This afternoon she started having some periods where she seemed to be feeling a little better. She could be awake for short periods of time without crying. She'd still cry and fuss here and there, but at least she seemed a little better. Tonight she got fussy again when she was having some gas...I guess her tummy was hurting her. Once she got over that, she was very tired and would have slept if not for her brother who kept fussing! After some time in the night nurse's arms and a dose of clonidine...she drifted off to sleep. She finally seems to be a good, deep sleep. I'm hoping and praying for a good night's sleep for her tonight and for her to wake up with smiles tomorrow! This has been one heck of a bad streak! I'm SO ready for some good days!!! Thank you for keeping our precious girl in your prayers! Today has been another rough day for my girl. She was up crying off and on throughout the night, but she did get some sleep in her chair. Today she's been a little more sleepy, which is good because she's still crying when she's awake (so far no improvement in that sense). There was one brief period where she was awake and just looking around with these big, huge eyes...but then the crying started back up. She did have a horrible breath holding incident tonight...she held her breath til she turned completely purple, stiffened out, and then looked very dazed afterward. Very scary. The good news is her night nurse is going to be here tonight (and tomorrow night)! I can't even explain what a blessing it is to have someone that genuinely cares for Reagan taking care of her through the night (too bad she's not available more nights)!! The same goes for our day nurse. She has ongoing issues with her back, but she loves Reagan and takes such good care of her, it's a huge relief for me...I wish we could have her here every day!!! (No seriously, we've offered her our spare bedroom but she hasn't taken us up on it!) Here are a couple pics of Ryan from yesterday. Look at the size of this boy! And not even 3 months old yet! Reagan slept well last night but woke this morning screaming and has been crying or screaming every waking moment since! We've been alternating Lortab and Norco (the stronger version of hydrocodone) and that has helped a little. She's been sleeping off and on all day. When she's awake, she's hysterical. She flails around like crazy and sweats so much, her hair gets soaking wet! Another thing we've noticed is that her lips get super dry and flakey...like something is eating them away. Something we definitely need to look into. I'm hoping and praying she'll sleep tonight (no night nurse til tomorrow). Please keep her in your prayers! Here are some pics from bath time today!! Reagan had another good night's sleep last night. She did have a dirty diaper though, poor thing, no telling how long she had been laying in that!! It was one of three today! It's all or nothing with this girl! She's been a sweet, smiley girl all day today. Very alert...a little crazy at times. She's definitely showing some signs of her dysautonomia. Her hands and feet have been ice cold and clammy but her body is hot and sweaty! Lots of kicking around, but her left hand (which is usually up in her hair or in her mouth at all times) has been relatively calm today...just laying on her lap (and she was even sitting on it at one point)! She's been very happy, but at times she'll yell out (like she does when she's getting a little overstimulated). Things are just a little off. I'm hoping she can pull out at least one more good day, but who knows. Nothing is guaranteed! We just never know when it's going to strike again...it definitely makes it hard to do things and go places. We get little hints that the bad days are coming, but we always hold on to hope that this will be the time she skips over them and doesn't have any bad days! The good days are so good...but the bad days are SO bad! Please continue to keep her in your prayers! Reagan slept the whole night through last night...but this morning when I went in to check on her, she had rolled completely over onto her face/tummy. I think she had started out on her side but then sometime in the night she rolled over and then got stuck and couldn't turn back over!! It sure didn't look comfortable..I'm just glad she was OK! She's been a sweet girl today. Very smiley and laid back. She's been a little spitty and sensitive to certain things at times. At one point her cheeks were really red and flushed and one of her arms was all red and splotchy! I was worried she might have had an allergic reaction to something, but then it just went away and she was fine! All in all, a pretty good day for my girl! Today we broke out Reagan's old exersaucer for Ryan. He's actually a little young for it, but he seems to like it! I like the idea of something that gets him out of my arms for a while and keeps him happy...even if only for a few minutes!! Reagan had another groggy day. She slept the whole night through and then was reluctant to wake up. She woke up at noon with our encouragement and was awake for her one and only therapy, OT. She was a good girl, very sweet and smiley. She was actually quite alert, once she finally woke up for the day! Hoping for some more alert/happy days to follow! No time to post tonight...I've had my hands full with Ryan. Normally I try to get half of my post written early in the day and then complete it that night after Reagan goes to sleep, but Ryan has been quite the handful and I haven't had a second to myself! He's gotten into a lovely habit of taking his naps early in the day and then at night staying awake (and being hyperactive and fussy) until it's time for us both to go to bed. So that doesn't leave me much time for the blog when I'm trying to keep him from crying, give Reagan all her medicines, make Reagan's formula, and give her some attention and love as well! Not to mention, Ryan isn't sleeping as well as he was before (after initially starting the prevacid). He's very restless and grunts and groans and feeds all night long. I'm waking up absolutely exhausted from him keeping me up all night!!! As far as how our Thursday went, Reagan slept most of the day (obviously her catch up day). She woke up in the morning, long enough to see her vision therapist and OT, but she was groggy and fell back to sleep so we canceled her teacher. Her PT came anyway and she took advantage of the fact that Reagan was sleeping and got in some good stretches! She slept most of the afternoon and then woke right around 7:30pm. She was a sweet girl and stayed awake til her dose of clonidine and was asleep and in bed by 11pm. I'm hoping for a happy awake Friday!!! Reagan slept last night!!!! Finally, a good night's sleep for our girl! She woke up smiling today...so that's always a good sign. She seems to be feeling a little better...more like herself. She's been a little spitty and chokey at times, but she's been chewing on her fingers a lot which I think might be the culprit. She still has teeth that are trying to come in, which might explain everything. Her other bottom tooth is loose and her top two middle teeth are pointing out more because of the permanent teeth pushing down on them. It's funny. Reagan didn't get her first tooth until she was over a year old (and then they all came in within a year's time), but here she is loosing teeth and getting her permanent ones early!! She's been a real sweetie today. Hoping for more days like this in the days to come (and more sleepy nights)!!! Reagan slept some last night...I'm just not sure how much. I do know this morning she was turned around in her bed again! She looks a little better today than yesterday (her eyes aren't bloodshot anymore), but she's still off. Her hands and feet were still clammy (sometimes hot, sometimes cold) and her face was red and flushed at times. Maybe a little less chorea, but still very tense. This afternoon/tonight she seemed more smiley and normal. Hopefully tomorrow she'll be back to her happy self. Tonight we have a night nurse but I hope she sleeps...she needs the rest! We're still breathing a sigh of relief after everything we went through last week with Ryan (if you missed it, see here.) He's been a real turkey today...super high maintenance and not sleeping much...but he's healthy, so we can't really complain. Thank you all for your prayers!! They were answered! Reagan started getting fussy again right before bedtime last night. I gave her some Lortab to try to calm her down and help her sleep...but it didn't work. She didn't sleep at all last night. She would fuss here and there but she spent most of the night just kicking around in her bed. I found her this morning completely turned around with her head up against the side of the bed! Her mood has been OK today. Not great, but not horrible either. She's still very tense, her cheeks have been red hot, she's having lots of chorea, and a little sensitive and on edge. You can tell she's tired...her eyes are all bloodshot and she just looks exhausted. But no sleep. Hopefully sleep will find her tonight. Today we got some news. Some really good news! A few days ago we had a huge scare. Wednesday afternoon (after Mike got home from work) I left the kids with Mike and ran to the grocery store. Ryan was furious! He's definitely a momma's boy and he cried the entire time I was gone. He was beyond hysterical and during his freak out he did something that looked like a seizure. He actually did it six different times. Mike was worried and called me, so I rushed home! He calmed down as soon as I got home and he never did it again. I took him into the pediatrician the next morning and all seemed fine, but she ordered an EEG just to be safe. Friday morning we went in to get Ryan's first (and hopefully last) EEG. It was a surreal thing. I had hoped he would never have to go through any of these sorts of things, yet here we were. Ryan freaked out while they were putting on the leads (like I knew he would) and he actually did "it" again and this time I saw it. He did this weird thing with his face while he was crying...I had my arms over his arms and legs and they never moved...just his face. He did it multiple times and even though he wasn't completely hooked up yet, he was hooked up enough and they did catch it on the EEG. My gut feeling (after seeing it first hand) was that it was NOT a seizure, that he was just doing something weird while trying to catch his breath while crying...but it's understandable why it would have freaked Mike out! It was obvious that it was brought on by the crying episode and I'm unaware of any seizures that are brought on by crying (I remember having this conversation with Reagan's neurologist a long time ago). We had to wait all weekend but finally this morning his pediatrician texted me and told me he had a NORMAL EEG!!! What a relief! Prayers answered! Thank you God!!! Reagan slept fairly well last night. She was very restless and kept flailing around...but she slept in her bed and she slept without waking til 6am. She woke upset and crying but eventually settled back down and slept til 9:30am. Today she's not screaming, but she's crying a lot and she's not sleeping nearly as much as she did yesterday. She also has gotten so worked up crying that she holds her breath til she turns purple!!! Again, it definitely seems like she's in pain, but nothing seems to be helping to relieve that pain! Very frustrating! The solution...Grandma. Grandma came in this morning and after a little Grandma therapy...cuddling and sleeping on Grandma's chest this afternoon...she woke up and finally stopped crying. She's been better ever since. Not smiley, but calm and we have gotten a few laughs out of her! It seems she's turned a corner! Hopefully she'll be able to get some rest tonight and wake up a new girl tomorrow!! Thank you for your continued prayers for our sweet girl. Reagan fell asleep last night with the help of Clonidine. It did seem to make her a little crazy at first and she screamed some (like the night before), but then she fell asleep and slept all night! I would have never guessed that she would have slept being as restless as she was yesterday. That was certainly an answer to prayers. This morning she woke up with wide, wild eyes and within minutes, she was screaming. When I say screaming, I mean screaming!!! Blood curdling screams. I don't know what it is that makes her do this, but severe pain is the only thing that makes any sense. A dose of Lortab seemed to help and she was able to doze back off. She keeps waking up screaming and crying but eventually goes back to sleep. We've been alternating Lortab and Ibuprofen and that seems to help (her sleep more anyway). I hate seeing her so miserable. I wish there were something, anything, we could do to help her. The only thing that seems to help is time. Poor thing. Hopefully she gets some sleep tonight and we see a happier girl tomorrow... Grandma is coming to see her! Last night we could tell Reagan was a little on edge. She wasn't settling down even with the Clonidine and she kept having the crazy laughs. Mike tried laying down with her and she got a little fussy, crying for a minute or so and then she was out. At this point I thought it was over...she was definitely going to have a crying all day sort of bad day today. She slept maybe an hour. When she woke up she wasn't fussy, but she kept yelling out. The night nurse was here so she stayed up with her, but Mike and I kept waking up because we'd hear her. We thought she was crying but the nurse said she was actually just yelling out but still happy. I got up at 4am to check on her and she was laughing her crazy laugh, but she wasn't upset. She never fell back to sleep. She did have four dirty diapers today, definitely a sign that something is off with her GI system. She's been clammy and extremely nauseous today. She's thrown up several times but is just all around gaggy and retching a lot. BUT she's not crying. I don't know if she's doing this instead of the crying or what. We haven't seen her super nauseous like this in a very long time (and usually it was at the end of a bad streak...after days of crying). Not sure what exactly is going on with our girl!?!?! Then right around 6:30pm tonight Reagan started freaking out. Screaming crying! It definitely seemed like she was in pain. I gave her a dose of Lortab and she got a little groggy and dozed off and on for a bit and then she woke back up and was better. Still having crazy laughs, gaggy, and super sensitive to air and noises, but not crying anymore. I would LOVE for her to sleep tonight, but I'm just not sure that is going to happen. She's just so on edge and tense. Her whole body is very stiff and rigid. Please keep it in your prayers that she can at least get some sleep tonight and hopefully feeling a little better by tomorrow. Reagan had another good day today. She slept all night and woke up right around 7am (long enough for the night nurse to get in some loving before 8)!!! She's been a sweet girl again today. Lots of smiles. Lots of therapies. This morning she had vision/OT and she did great. Her teacher came at noon and then her PT came at 2! After that she even managed to get in an hour in the stander before we gave her a bath! It's been quite the busy day. This afternoon she's sounded a little spitty/chokey at times and she's also yelled out a few times (the crazy sort of yell...not good)...but as of now (even if she's on edge), she's still got a smile on her face. Today is actually day 9 of her good days, so this weekend isn't looking too good. I keep holding out hope that some day she's going to skip over the bad days and give us a nice long extended string of good days again.That sure would be nice. We could start with her getting a good night's sleep tonight. Please continue to keep her in your prayers (and say an extra prayer for her little brother, he's been giving us some grief lately). Reagan slept well again last night. She woke up this morning all smiles and wide awake!!! I just love these days when she's so alert and so happy!!! She's had a smile on her face all day long. She had speech therapy this morning and then again this afternoon (private speech therapy and then the speech therapist from the school). She was just wonderful for both! This afternoon we took a walk down the street. It wasn't nearly as nice as yesterday's walk (the temp has gone up 10 degrees in one day), but both kiddos seemed to enjoy it. 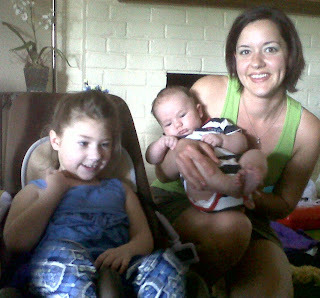 Reagan's been laid back and smiling all day long (if only Ryan were that easy). Her night nurse was sure happy to see that smile tonight! Hopefully she gets some more good sleep tonight...she needs it! Thank you for your continued prayers for Reagan (and her handful of a brother)!!! Reagan slept well again last night and then woke this morning as smiley and happy as can be. She's definitely more awake today...FINALLY! She's had four different therapies...so it was good she was actually awake. She had speech this morning and Grandma would be happy to hear that she ate some apples/cherries. Not a lot, but she did eat some and seemed to enjoy it. Then she had OT. She's very "crunchy" today (she's constantly crunching in half)...so it made OT a bit of a challenge. After OT she was acting like she might fall asleep but it didn't last long and she was wide awake and ready for school by the time her teacher got here.Those three things were all pretty much back to back to back. Then we had a two hour break and a nurse came by for orientation. Yet another Wednesday nurse. Hopefully this one works out (she'll be working tomorrow). We had just enough time to get her a bath and then it was PT at 3! It's certainly been a busy day...I'm just glad she was awake and able to tolerate it all. And she hasn't just tolerated it, she's smiled and grinned from ear to ear all day! So nice to see my girl awake and smiling!!! Unfortunately tonight I've noticed major temperature dysregulation. She feels very clammy all over. Her body is hot and sweaty but her arms and legs (and even more so hands and feet) are cold! I know we don't have long before the bad days are back, I just hope she'll hold out another day or two!!! Please keep it in your prayers that this next bad streak is a mild one! No idea what happened! Blogger deleted my blog post and left me with a little half written draft! I'm so mad (like I have time for this). I went back and rewrote it, so here you go! Ryan has been high maintenance tonight. It's getting harder and harder to get the blog done each night. Ryan is so needy and it's hard for me to put him down without him crying (and he only makes it a few minutes with Mike before he starts crying). I'm going to continue posting daily updates because I think it's important in helping us keep track of things with Reagan, but I have a feeling late posts are going to be a common occurrence (at least until Ryan starts going to bed at a reasonable time)! Reagan slept all night last night and then slept in again this morning as well. She's been very sleepy/groggy again today. Reluctant to wake up and then dozing off and on throughout the day. This afternoon we went into the medical center for a blood draw. We're doing the whole exome sequencing to try to figure out the exact mutation that is causing Reagan's mitochondrial disease. She was enrolled in a study that was doing something similar, but with a study they take their time in analyzing the data and we still haven't gotten any info back from that. This is now a commercially available test (paid for by insurance), so hopefully we'll get the results more quickly! After that we went to her neurology follow-up. This is a new neuro and it's just not the same. I miss Reagan's old neuro. He moved away and we were forced to choose a new doc and I'm not sure it's the right fit. Thankfully, since her seizures have been controlled, we haven't really needed much from neurology lately. She did mention her last EEG (done 9 months ago), was definitely the most normal EEG she's ever had. Granted, it's still not "normal" (the background is very slow), but there was no epileptiform activity and even she small discharges she was seeing were nothing. She did bring up the fact that Reagan has been seizure free for over two years now and that's usually the time when they talk about weaning back the seizure medications. However, with Reagan's history and trying so many medications to finally get control, she agrees that maybe we should hold off on a wean. I'm good with that. If it's not broke...don't fix it! When we got home yesterday Reagan's speech therapist was waiting for us. Reagan actually woke up and did a good job during therapy and she stayed awake til 10:30pm (the longest she had been awake in days). I'm hoping she'll give us some good awake/alert days before the bad days rear their ugly head again! Reagan slept all night and then most of the day again. She's still pretty laid back but at least I've gotten some smiles out of her today. I'm not sure why she's having more sleepy days lately. It worries me a little. I'm hoping tomorrow she'll be back to her feisty normal self. Her bother has no problem with being feisty!!! He's a piece of work. Wants constant (undivided) attention. Doesn't he know we needed an easy baby?!?! 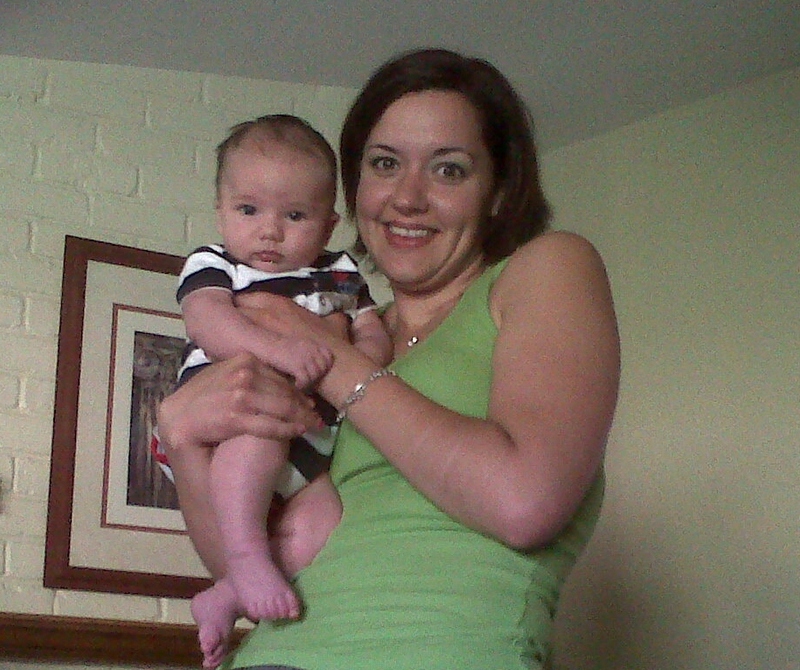 I hope everyone had a wonderful mother's day! I had blueberry pancakes for breakfast and turtle cheesecake for dinner (can we say diet next week)! I also got to take two naps! Mike watched the monitors and I was able to sleep without having to listen for the kiddos! Too bad they left me feeling more tired than before!! This is probably one of the few mother's days that I didn't see my mother, but she came last weekend and she's coming next weekend! I'm so lucky to have such a wonderful mother. I love you mom!!! Reagan didn't sleep much (if any) last night. She was up all night with crazy laughs! We were supposed to have a night nurse but she was a no show. Still not sure what happened with that (someone was filling in for our good night nurse). Anyway, so our girl was up all night. She was in her bed, but awake. It was actually her first night in her sleepsafe bed. We've had it for a while now, but it was crammed in her room with her other bed and wasn't really usable. This past weekend Grandma moved some things around (we still haven't figured out where we want to put her other bed) and now the sleepsafe bed is good to go. The mattress seems terribly uncomfortable though, so hopefully Reagan is able to sleep on it. The laughs have continued today as well. She did have one huge throw up this morning, but ever since she's been good. She had OT and PT this morning and also spent some time in her stander. She's been a good girl. A crazy laughing girl, but a good girl. Tonight she started getting sleepy but then her brother woke her up again. Thankfully she did go back to sleep! Our girl needs her rest! Last night Reagan was getting a little upset so I gave her her nightly dose of Clonidine and a dose of Ibupofen. She calmed down after that and eventually fell asleep. That lasted about an hour an a half and then she was awake again but calm. She spent the rest of the night awake, laughing here and there, but never falling back to sleep. She's been much more laid back today, still some crazy laughs but that's OK. Obviously exhausted, but no longer on edge. She has thrown up a couple times, but she hasn't really been nauseous per say (just random throw ups) and she's had two big dirty diapers. She made it 2/3 of the way through vision therapy this morning but she got really tired after she threw up. She only slept for 10 min or so (long enough for the therapists to leave) and then she was wide awake and ready to go for school. She actually never looked sleepy again until tonight. We're definitely in recovery mode at this point. I'm guessing a sleepy day is in her near future (hopefully starting tonight). On another note...yesterday I saw on Facebook and it was later confirmed on her Carepage, precious Ainsley Paige passed away yesterday after surgery. Ainsley was only 6 yrs old and had many similarities to Reagan (she was actually the reason I had Reagan tested for mito in the first place). She went in for a fairly routine surgery yesterday morning and passed away yesterday afternoon! This is so scary. It really shows you how fragile our kids with mito are and you really can't take a single second for granted. This disease is so horrible. Please keep her family in your prayers. Reagan had a miserable night last night. She fell asleep for short periods of time in her chair, but she spent a lot of time awake and crying. Poor Mike, he had to keep getting up to check on her, so he didn't get hardly any sleep at all and then he had to go to work this morning! Thank goodness the night nurse comes tonight. Today was about the same as yesterday. Reagan has been doing a lot of crying and moaning. I was texting back and forth with her palliative care doctor yesterday and we decided on trying something with a higher dose of hydrocodone. She's been getting Lortab with 2.5mg of hydrocodone (and 167mg acetaminophen) per dose but it only seems to help for an hour or so before she's back awake and crying again. So today we tried Norco with 5mg of hydrocodone (and 163mg of acetaminophen)...that's double the hydrocodone. I have to say...after what happened with the methadone and this doctor...I was a little nervous in trying a stronger medication. But since we were doing it during the day (with her nurse watching her like a hawk and connected to the pulse ox), I decided to go ahead and go through with it (but I was still very nervous). I was surprised; it didn't work as fast as I had thought. It took about 15min and then POW, she was out! Well, at first she wasn't really out, out. She was more very sleepy but eyes still open.Then after only 30min of sleep where her 170bpm heartrate finally dropped down to the 100s, she woke up crying again (and her heartrate went back up into the 150s). Her oxygen saturation was doing some funny things (kinda going up and down for no reason, which we think had to do with an old probe we were using), but then all of a sudden she started holding her breath (which she's been known to do at times). She was turning purple and her sats dropped to the 30s so we broke out the oxygen! That wore her out and she calmed down again and everything normalized. I'm not sure if that had to do with the new medication or not...but we won't be using that again until we get desperate again (maybe the next bad cycle). Tonight she's still fussy and stressed, having lots of chorea (flailing her arms and legs), but she's not crying. I really hope she's able to get some sleep tonight. If not, I know she'll be in good hands with the night nurse. She just adores Reagan. Thank you for your continued prayers for our girl!!! Reagan slept last night...she was restless and I heard her laughing or talking at some point...but she slept nonetheless. She actually slept in some this morning as well. Maybe because she was so restless last night. Who knows. All I know is that when we went in this morning to check on her, you could smell the "bad day smell" and she was very sweaty (although her hands and feet were still nice and warm). I looked back through the blog and it's been another 9 good days in a row. Now granted, one of those days was more of an off/recovery day and a few of those days were sleepy days, but any day my girl is not crying or in pain is a good day in my book. Unfortunately, this morning she woke screaming!!! She's pretty miserable. She did calm down for 20min or so while Grandma was holding her. She started grunting and I thought maybe she was struggling to go to the bathroom, but I checked her and she didn't seem to have anything in there. The crying started back up and we had to put her arm restraint on, just to avoid any accidents. I tried the Ibuprofen and an hour later she was still crying. I tried the Lortab and 10min later she was OUT. It didn't last long though, she was back awake in less than an hour. She woke OK...she was still agitated, but not crying (for about 45min or so), then she started back up again. It's been like that all day. Poor thing. I SO wish she could tell us what it is that is bothering her when she gets like this. Is it her head, her stomach, joint pain?!?! What is it?!?! It's such a helpless feeling...not knowing what it is, and not knowing how to help her! On a good note, Ryan seems to be sleeping better. I don't think it's a coincidence that it started only a couple days after starting him on Prevacid. Now, all we have to do is figure out a way to finance this expensive medication! I still can't believe that it's $100 even with insurance!!! There is a generic though, so hopefully we can just switch over to that! Reagan's nurse didn't come in today, but at least my mom was here to help! She's headed back home first thing tomorrow morning, so hopefully Reagan's nurse is able to come in. It's a lot more stressful now that there are two kiddos! It's just not doable for me to be the only one here when Reagan is having one of her bad days! It's hard enough managing the two of them on a good day! Please keep it in your prayers that Reagan's nurse gets over her back problems and that we're able to get some good new people out here to serve as back up! And most importantly, please keep it in your prayers that Reagan gets back to her happy self as soon as possible! Sorry...another late post! But with Ryan constantly attached to me, it's hard to get things done! So here's Sunday's post. Reagan has been a precious girl again today. I think she slept last night. Again, I never heard a peep out of her but when I looked at the monitor at 7am, there she was wide awake with all her covers kicked off! She's been a smiley girl...super sweet and happy to see her grandma! She was a little nauseous and threw up once this morning and then had a couple coo coo moments where she yelled out all of a sudden, but otherwise she's been good. This afternoon we went to the mall and left Ryan home with Daddy. It was a girl trip! She was great the whole time and seemed to enjoy all the people watching. When we got home, Mike met us at the door with Ryan. Turns out, he's a mommy's boy! He seemed a little distraught (we were gone 3hrs)...I guess he thought I had left him. He got over it. So another good day. Keep them coming. 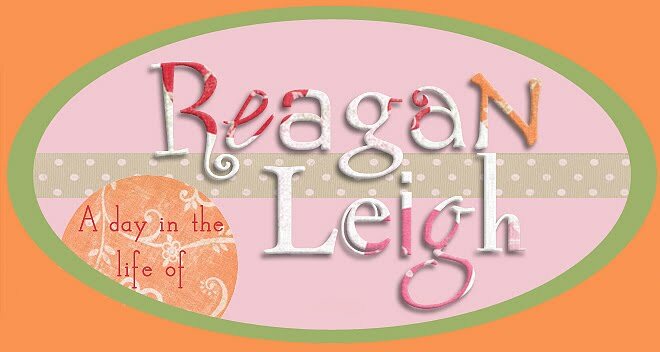 Please keep that in your prayers...and say an extra prayer for Reagan's nurse's back...she's already called in and is not coming in on Monday! Ugh. I think Reagan slept well again last night. I didn't hear a peep out of her, but then again when I got up at 7am with Ryan she was wide awake and hadn't made a sound!!! So who knows. She's been a good girl today. Very snuggly. Her hands and feet were a little clammy this afternoon and she did have a teary eyed moment when Mike and I were talking this morning, but I'm hoping she'll hang on and continue to have good days because Grandma is coming in tomorrow and I know she wants to see her girl happy! We all do!!! Reagan has been sleeping through the night, but it's a restless sort of sleep. She kicks, flails, & squirms all around in her bed...all the while her eyes are still closed and she's still technically asleep. Although I'm guessing it's not a very restful sleep. She was a little groggy this morning but she eventually snapped out of it and was wide awake this afternoon. Head control was a little lacking, but she was still smiley and sweet, so all was good. Her brother has been a handful today. Not sleeping much and so high maintenance! Hopefully he'll start mellowing out soon. Today...a little bigger, you think?!?! Reagan slept all night again last night (of course...we had a night nurse) and then she woke up this morning super sweet! She was awake for a little while and then fell back to sleep just in time to miss vision therapy. Her PT came and stretched her while she was still sleeping but she did finally wake up while she was working with her. Her PT put her in her stander and then she had school. She was good for her teacher but started looking a little groggy toward the end. Not long after that we had to leave to go get her gj-tube replaced (nothing happened...it was just time). She slept most of the way in the car and then woke up as we got her out of the car. Thankfully her brother slept the whole time we were there. It was a really quick change out. We waited in the waiting room for the least amount of time ever and then they took her back and changed it out in record time as well. Amen for easy tube changes! I know it's not that easy for everyone, so I am so thankful each time it goes smoothly. Reagan was awake the rest of the afternoon. Not overly happy, just content and crunchy (rolling around a lot and crunching in half so she can pull her hair). Tonight we have a night nurse again. Reagan is already dozing off. She needs her rest, so hopefully she'll sleep through the night again tonight! Reagan finally slept well last night...and then she slept all day today as well! She was awake for a short 45min spirt, but then she fell right back to sleep. Tonight she was really moving around a lot, but she never opened her eyes once! I guess this was her catch up day for sleep. Hopefully she wakes up tomorrow feeling refreshed and all smiles! Ryan has been pretty high maintenance today. I finally got the pharmacy mess straightened out so we coukd get his Prevacid. It was over $100 and that's WITH insurance! How can that be?!?! All I have to say is it better work (although we'll have to get a loan to keep him on it)! I sure hope he sleeps tonight because he's being quite the handful right now!! Reagan was up laughing again last night. She fell asleep around 11:30pm with the help of Clonidine, but was back awake by 12:30am (because of Ryan who had his worst night yet). She was kicking around laughing again, so I gave her some Lortab in hopes that she'd actually get a good night's rest. Nope. It helped her to fall asleep, but she was back awake an hour or so later. Her laughs at night were a little more on the crazy side. I think she kept going in and out of sleep until this morning when she finally seemed to be sleeping a little more soundly and she slept in til 10:45am! She woke with smiles (no laughs) and has been a sweet precious girl all day (although she has been a little sensitive, startling easily). She still sounds a little congested and she was coughing a little today, so I'm wondering if she's got some sinus drainage going on. Hopefully it's just allergies (her brother and Daddy have also been a little congested as well). Speaking of Ryan, he had his 2 month visit this morning. He was 14lbs 11oz (97th percentile) and 25in (94th percentile). I told you he was a big boy. I mentioned all of his crazy grunting, nonstop hiccups, horrible sleep habits, and spitting up and the doctor thinks he probably has reflux. She said that would also explain his aversion to the pacifier and wanting to nurse all the time (because when something is going down, nothing can come up). We're going to give Prevacid a week trial to see if it improves his symptoms (of course the pharmacy didn't get the prescription so we have to wait to start it til tomorrow). Oh how great it would be for him to be a better sleeper (and happier). She also seemed very impressed with where he is developmentally. I asked her what he should be doing at 2 months and she said not much more than pee, poop, eat, & sleep! His head control is great for his age, but he's also tracking, smiling a lot, and we've even gotten a couple laughs out of him! This is such a different ballgame for us. It's great and we're excited about the upcoming months when he really starts doing some exciting things. I'm also hopeful that he'll inspire Reagan and we'll see some progress out of her as well. That would be awesome! !